Multiple ARIA award winner & multiplatinum singer/ songwriter Delta Goodrem has today released her brand new DVD/Bluray, WINGS OF THE WILD – LIVE, available to buy and download NOW through Sony Music Entertainment Australia. 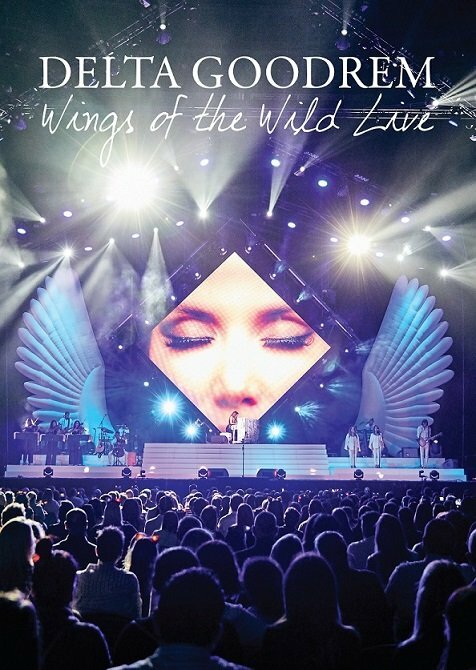 WINGS OF THE WILD – LIVE made its broadcast premiere in June 2018 on the Nine Network, and the DVD/Bluray release features performances of her biggest hits to sell out arenas across Australia, as well as exclusive behind the scenes footage and commentary about the making of the tour. “I’m so excited to finally share the release of this DVD,” Delta reveals. “The Wings of the Wild Tour holds such a special place in my heart of the time we all spent on this incredible journey together”. Goodrem’s fifth studio album WINGS OF THE WILD was released in July 2016 and topped the ARIA Albums Chart upon its debut. ‘Wings’, the first single of the album, hit #1 on the Aria Charts and is certified 2x platinum. The album also includes hits ‘Dear Life’ (certified platinum), ‘Heavy,’‘Enough’ featuring US artist Gizzle, and ‘The River’. The album’s accompanying sold out arena tour, where this was filmed, broke records as Delta became the highest-selling Australian touring artist in 2016. Delta Goodrem has amassed a multitude of hits and achievements during her career. The talented performer has achieved in excess of 23 x platinum sales, 4 #1 albums, 9 #1 singles, 17 top 10 hits, 16 ARIA Awards, a Silver Logie Award & 3 World Music Awards. Having achieved multi-platinum-selling status, over 8 million records sold worldwide and started her own label imprint with Sony Australia, The House of Oz Records. The gifted singer, songwriter, performer and pianist has, for the past 15 years, provided a soundtrack to the lives of a generation of music fans in Australia, the U.K., and around the world. Goodrem has recently completed her seventh season as a coach on The Voice Australia on the Nine Network, and is currently working on new music.